The auditor general has refused to fully sign off MPs' expenses accounts for last year, amid concerns about nearly £14m of payments. Amyas Morse carried out a "full scope audit" of £98.1m expenses paid in 2009-10, the year of the expenses scandal. Early tests suggested 25% of payments had not been backed by evidence required - amounting to £7.9m. That figure fell to £800,000 following an 11-month effort to recover the missing documentation. The National Audit Office looked into £98.1m of expenses claims reimbursed in 2009-10, as well as £47.4m of MPs' salaries, pension contributions of £12.6m and a £226m liability on the parliamentary contributory pension fund. Changes allowing a more wide ranging "full scope" audit were brought in last year. Previously auditors did not try to investigate expenses beyond an MPs' signed declaration that any claims were incurred for the purpose of carrying out their work as an MP. However the report says that an early "sample testing" of claims made between April and July 2009 showed 25% of payments were not backed by the evidence required under the rules at the time. A "major project" began to try to find the missing evidence for £7.9m of payments - 11 months later that figure was reduced to £800,000 of claims largely relating to staffing, rent, mortgage interest and office rent. 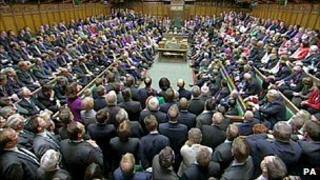 Commons authorities say evidence for a further £60,000 of expenses has since been received. The Commons agreed it would try to recover the money if there was direct evidence a claim should not have been paid, or there was no other evidence to support it - amounting to a total of £33,794. But the Commons has written off £17,612 of that which was paid to former MPs, because it was considered unlikely to be recovered. A further £1.8m of claims could not be investigated by Mr Morse - because they were made by MPs currently under police investigation. And although evidence was submitted for a further £11.3m of payments for travel, communications, subsistence and phone calls which met requirements under expenses rules, it was not considered sufficient by Mr Morse "to confirm the regularity of expenditure". "I am satisfied the evidence requirements of the Green Book have been met. However, in applying the professional standards that underpin my audit, in my opinion, these requirements are not sufficient to allow me to confirm that expenditure has been incurred for Parliamentary purposes," he said. "This lack of evidence does not necessarily imply that expenditure was paid incorrectly." Mr Morse's office said he had "limited the scope of his audit opinion" on the regularity of the 2009-10 scheme because of the concerns. The Members Estimate Committee, which represents MPs, said the Communications Allowance - the source of many of the queried claims - had now been "severely restricted". Committee member John Thurso said: "The NAO concluded the accounts were a 'true and fair view' and complied with the relevant accounting standards... We recognise there were clearly some areas where the checks and balances were not adequate but these issues had already been identified." But Matthew Sinclair, of the Tax Payers' Alliance, said: "This is an ongoing stain on the reputation of Parliament and justice has to be done, those responsible need to be punished seriously." A new system of MPs' expenses, regulated by an independent body, was brought in for the new Parliament - although there have been many complaints from MPs that it is not working properly and is too expensive. Interim measures reducing what MPs could claim for were introduced by Parliament last year, after the expenses scandal broke. In his comment on the report, the House of Commons Accounting Officer Malcolm Jack said early work by the NAO had "identified problems with the system of internal control", which had not been rectified "as quickly as I would have liked". But he said the problems were addressed successfully over the following months which had reduced the number of payments missing evidence by 90%. He also said the leak of expenses details to the Daily Telegraph happened while claims and receipts were being scanned in to fulfil a Freedom of Information request. Mr Jack said the Commons' procedures were not to blame and the procedures used by the private contractor were not the "direct cause". "It was virtually certain, though, that the data was misused during the redaction process by one or more individuals who were not employed by the House but whose duties gave them the opportunity of access to the data," he said.